UCL spin out company, Space Syntax Ltd, has created the giant map of London’s street network which formed an iconic part of the Opening Ceremony for the 2012 London Olympic Games. The map – produced by Space Syntax to advise on plans for new streets and public spaces in London – was spotted by the Games’ organisers in a book about the history of mapping in London. The map is one of many produced by Space Syntax to aid property developers and city authorities plan the biggest urban centres on the planet, including Beijing, Sydney and Athens. 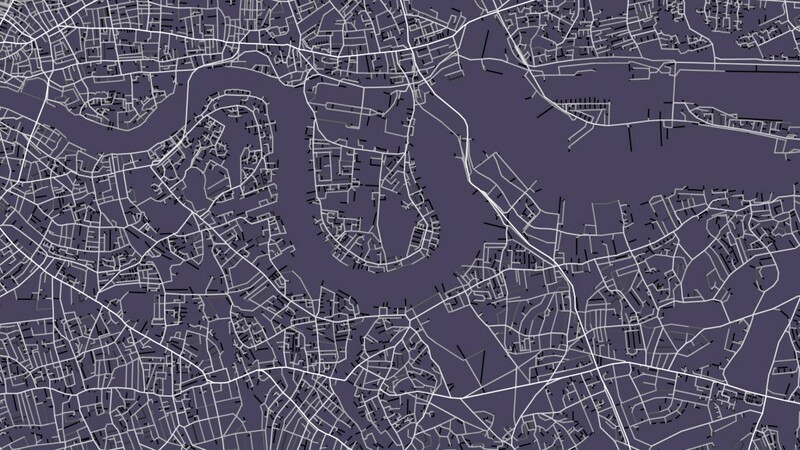 Based on mathematical analysis of street networks developed at UCL’s Bartlett School of Architecture, the map forecasts how people will flow through new developments and how this leads to social and economic benefits such as safer public spaces, more successful shops and higher property values. Space Syntax, which was founded at UCL in 1989, has used its map to redesign key public spaces in London including Trafalgar Square, the South Bank Centre and the Barbican. The map has underpinned many new developments in the capital, including Broadgate and One New Change in the City of London. Most recently it has been used to test proposals for the regeneration of London’s Elephant & Castle and Earls Court, two of the largest regeneration projects in Europe. Computer software measures the degree to which each street in the network is likely to be used by people on foot, on bikes and in cars and where people are more or less likely to use parks and public spaces. Each street is assigned a unique mathematical value, which is converted into a unique shade of grey – giving the instantly identifiable map which will have been seen by billions around the globe. The map was used to develop the masterplan for the Olympic site at Stratford City, where Space Syntax worked to connect the new streets and spaces into the existing communities surrounding the Olympic Park. “A city, after all, is a living entity, with life given by the millions of people who both shape and live in it. Dr Steven Schooling, who is a Director of UCL Business PLC and Space Syntax Ltd commented that “the interactions between Space Syntax Ltd and the Bartlett School of Architecture continue to set a benchmark for successful knowledge exchange between academia and industry, with both parties gaining significant benefits from a partnership which has fostered linkages in areas ranging from consultancy through to software development. The use within the Opening Ceremony for the 2012 London Olympic Games of a Space Syntax map of London’s street network, provides an excellent illustration of how mathematical analysis of street networks developed at UCL’s Bartlett School of Architecture have been translated by Space Syntax Ltd into tools and solutions which are having a substantive impact on urban planning in the UK and overseas”. Space Syntax’s mission is to enhance the social, economic and environmental performance of buildings and urban places by developing and applying a science-based, human-focused approach to their planning, design and operation. We exist to provide leadership and cumulative tested knowledge to support the development, dissemination and application of this approach. Founded in 1826, UCL was the first English university established after Oxford and Cambridge, the first to admit students regardless of race, class, religion or gender, and the first to provide systematic teaching of law, architecture and medicine. We are among the world’s top universities, as reflected by performance in a range of international rankings and tables. UCL currently has 24,000 students from almost 140 countries, and more than 9,500 employees. Our annual income is over £800 million.